Five years ago, four people entered our lives as strangers. I knew nothing about them, I knew nothing about what they did, I only knew that our doctors in NICU wanted us to see them all. We were new to this world of therapy and special needs. We were still convinced there was nothing “wrong” with our little boy and didn’t see what all of the doctors saw. I was hesitant to let them in our home and trying to fit them all in to our schedule was stress upon stress. The first to arrive was our Physical Therapy Supervisor, Mary Elizabeth. She was kind and patient. Most importantly she gave me hope. I remember her telling me that “on paper” she expected to see a child doing far worse than Braxton. It wouldn’t be until years later that she told me that in the early days she wasn’t sure Braxton would make it and she wasn’t sure what she could expect from him. Nevertheless, she never let that show. She never gave up on him and she guided us on this journey. She never treated him like a terminally ill child. She helped us build the rest of our team and ensured Braxton received the medical care he deserved. I’ll never forget how with one phone call a Genetics appointment scheduled in November was moved up to August to start us on our diagnostic journey. When the switch finally flipped for Braxton and again when we got our diagnosis and learned Braxton was definitely not terminal, she continued to make sure we were on target developmentally and set goals to get Braxton to reach higher and higher. At that first visit she told me it would be her partner, Gil, coming to work with Braxton. When Gil arrived, I was hesitant because apparently I had seen too much Oprah and I’ll admit I was worried about having a male in my house when my significant other was away. But, that was pretty foolish. Gil is a Physical Therapy Assistant, but let me tell you, he has been an invaluable member of our team. “Assistant” is so misleading. With the years of experience he’s had, there is no one else I would have wanted on our team. He was so gentle and patient with Braxton. And in his spare time he likes to dress up as a Superhero – who doesn’t want a superhero on their team!? We made S-L-O-W progress at first, but Gil always pushed Braxton forward. I have a 5 minute video of Braxton TRYING to roll over. And video of Braxton up on his hands and knees rocking back and forth TRYING to crawl. Five years later and Braxton is knocking Gil over as he rears up and smacks him in the chest wrestling with him. 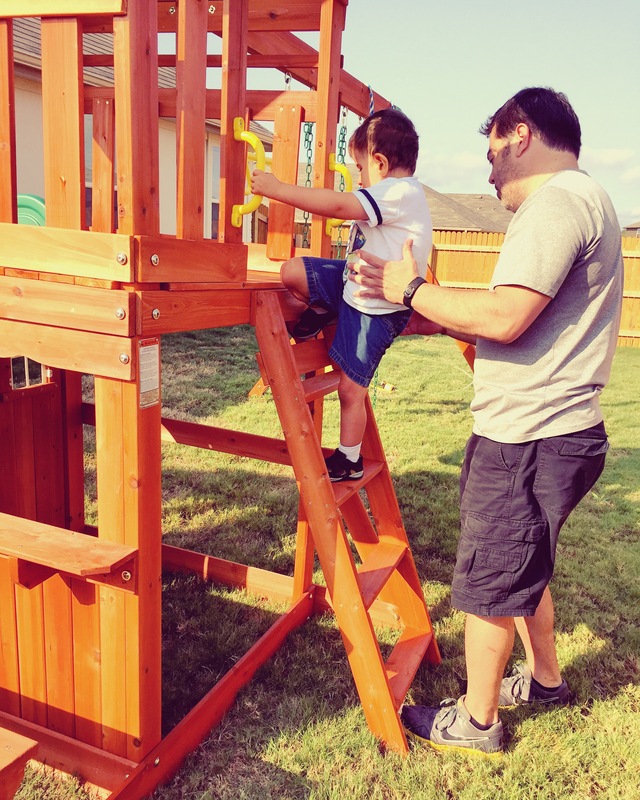 He is walking independently, climbing stairs – well, climbing everything really! The progress he has made is truly amazing. Shortly after Physical Therapy started, we still did not have a Speech therapist on board and Braxton needed help with feeding. I had no idea that Speech therapists could work on more than speech! Mary Elizabeth came to our rescue and called in a friend and colleague. 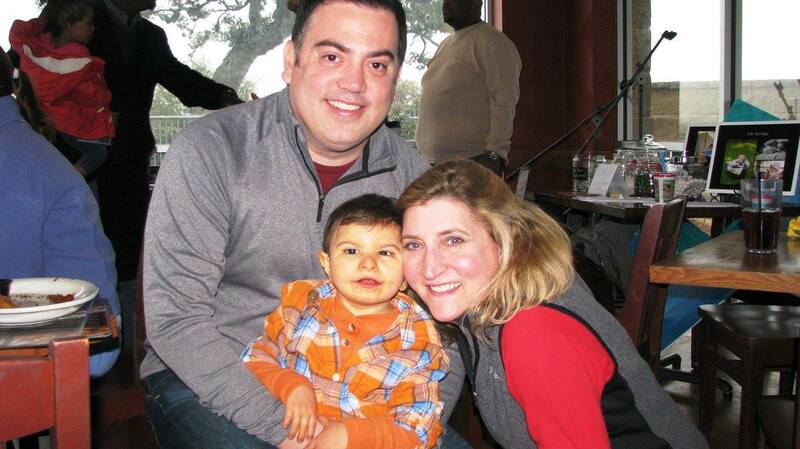 Lesli didn’t have any openings at first and I remember that she came out on a Saturday to do Braxton’s evaluation. Within a few weeks, she had a space open up for Braxton (or she made one!) and we began working on bottle feeds. 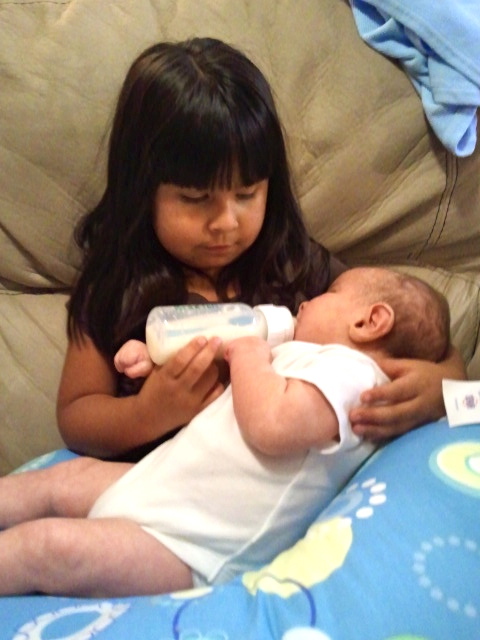 With her help, Aileen got to live out her big sister goal of helping to feed her brother. Bottle feeding did not last long as we learned Braxton was still aspirating (swallowing liquid in to his lungs), but we slowly worked back up to it, until Braxton just decided he didn’t want a bottle anymore. When we introduced baby foods, Braxton’s progress was miniscule. We celebrated BITES and when he ate HALF AN OUNCE. Now, Braxton eats 16-20 OUNCES EVERY MEAL! You would never guess he was a kiddo with such great feeding difficulties. We had a few regressions in there, but Lesli never gave up. She never let us give up. We continued to press forward and here we are with a hungry little man on our hands. We did also work on Speech and although we never really got any words from Braxton, we started on the road with Alternative and Augmentative Communication (AAC). Braxton is now using an iPad with Speak for Yourself to communicate with us. He is still not using it as much as we’d like, but he’s made really great progress. The last to join our team, was Elizabeth, our Occupational Therapist. OT is apparently really difficult to find! Thankfully, OT and PT look very similar in the early months, so we weren’t in too much of a rush initially. Elizabeth has always been super patient with Braxton. Fine motor skills are definitely one of Braxton’s biggest struggles and his progress has been very, very, slow. (It took 3 years to get him clapping!) But, Elizabeth never seemed discouraged or frustrated. She worked with Braxton at his pace, always pushing him a bit further out of his comfort zone. And she has always spoken to Braxton as if he understands everything she is saying and expecting more from him, because we knew he was capable of more! Braxton has made a lot of really good progress with his fine motor skills and we know he is ABLE to do so much, but whether he actually WANTS to or will perform is a different story. We know he can build block towers, but he prefers to pretend he’s going to put the block on top and then throws it at the last second in protest. He has certainly kept Elizabeth on her toes and she developed some super quick reflexes! Braxton working with Elizabeth and Lesli. After having worked with this incredible team for the last five years, this week has been pretty difficult for us as it has all come to an end. Braxton is starting Kindergarten next week and unfortunately, our team can no longer see him as our schedules just don’t match. When we moved outside of their service area, they all moved with us to stay with Braxton. So, I know if there were any way to work it out, they would. But, sadly we weren’t able to make it work and we have had to say goodbye to everyone this week. As I prepared myself to let them all go, I thought back to the days when we all started together. How worried we were. How clueless we were. Over the years, they became part of our family and were no longer strangers. I’ve learned about their families, met their children, commiserated together over school woes, cried together, and laughed together. They’ve watched my little man grow from this small baby who didn’t even fill up a couch cushion to this wild child climbing on tables and chairs, running away to hide from therapy. Every week, twice a week, for an hour each visit they’ve been in our home. It might not seem like much, but it adds up quickly and as the years pass so much life has been lived.